Tripping the light fantastic & bringing in the grapes . . . I referred to my first apartment in France as the cave. It had once been a grocery, or perhaps a baker’s shop–I’d heard different stories, but it had stone walls and was very dark. Not so bad on winter nights, quite cozy in fact with the wooden shutters closed. But sunny days, even with the shutters and windows flung wide, it felt claustrophobic. To check the weather, I’d have to open the front door, step outside into the narrow street, also quite dark, and look up over the rooftops to see if the sun was shining. Emerging from the apartment, I sometimes felt a bit like a mole. I’m now living in a third floor apartment that I like to think of, romantically, as a garret. It has skylights in the living room and kitchen and French doors opening onto a very tiny balcony. After being somewhat light deprived in my previous place, I’m now a bit obsessive about what streams in during daylight hours. I use the room with the best light for my study and over the past few weeks, I’ve developed a routine. I set the alarm for six, while it’s still dark, make coffee, and sit at my desk as the sky gradually turns light outside. The skylight in the living room is directly above the couch where I like to stretch out and look up at the sky — stars lately after a period of cold gusty winds. Rain, huge quantities of it, during much of September. One night I went to bed with the kitchen skylight open — there had been a break in the weather –and found the kitchen flooded the next morning. But, minor mishaps aside, while I love the sound and sight of heavy rain hitting the skylights, the storms over roughly a two-week period were catastrophic: several deaths, enormous property damage and disruption of services. For a winemaking area the storms, which arrived just as the grape harvest was getting underway, made for a couple of anxious weeks. Heavy rains cause the grapes to take on more water, this dilutes the flavour and sugar/acid balance. Too much rain can lead to swollen and split grapes which leads to mould and mildew. I’d learned this a few weeks earlier walking through the vines with Brigitte as she tested the ripening grapes to determine when to start her vendange. While the purple blue grapes looked and tasted perfectly ripe to me, Brigitte split one open, held it out in her hand for me to see. The pips she pointed out were still too green. A few more days of sunshine and, perhaps they would be ready to pick by the weekend. If the rain stayed away long enough. While Brigitte was deciding when to start her vendange, most of the cooperatives and bigger growers were already harvesting. In Laurens, ancient tractors and agricultural machinery the size of double-decker buses lumbered through the narrow streets. On my walks through the vineyards, I’d hear the massive blue pickers with their monster-like jaws then smell the drifts of wine scented air as they disgorged picked grapes into huge vats. A traffic jam in these parts during the vendange was two or three cars stuck behind a brimming tractor. Locals know to pull around even from the last car position. It’s taken me a while to judge exactly the right moment to zip around a ponderous vehicle and into the lane of on-coming traffic then back again in time to avoid a head-on collision. I was less apprehensive driving California freeways. On the other hand, I’m now a huge fan of the ubiquitous roundabouts which intimidated me when I first arrived in France, but which are a boon as I drive around the countryside getting lost — my way of familiarising myself with the area. If in doubt, just circle the roundabout until dizziness forces a decision. One Friday evening in mid September, I was still at my desk when Brigitte e-mailed to say that the vendange would start early the following morning. The harvesters were lined up — a team of young Poles who had picked for her before — and the forecast was for sunshine. 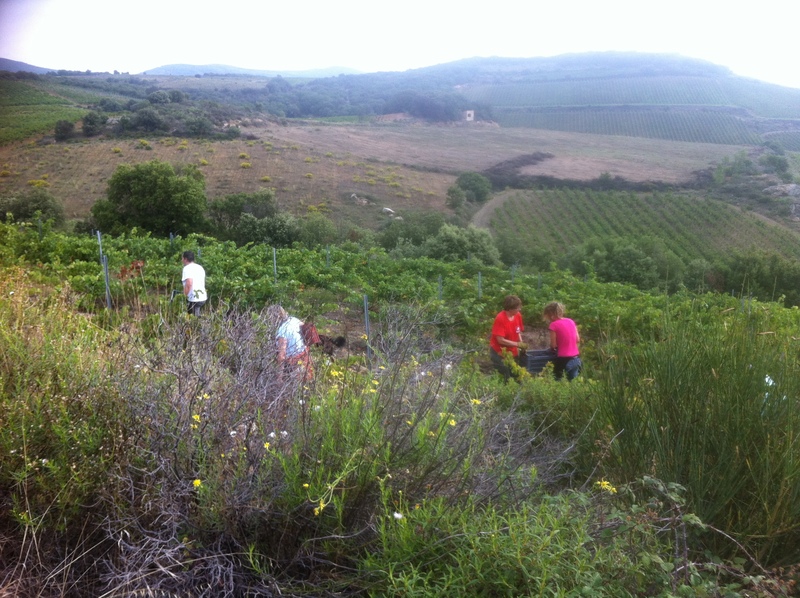 For this first harvest, they’d pick the Grenache which grows on a plot in the village of Corneilhan about 30 minutes from the Domaine de Cébène vineyards and cellar in Faugères. 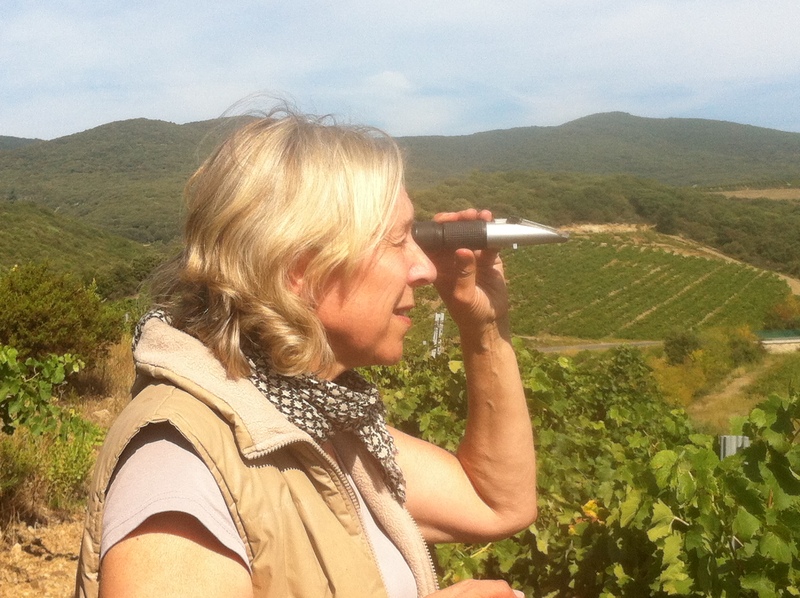 Brigitte has been making wine at Domaine de Cébène since 2008, but this would be the first harvest vinified in the brand new Faugéres cellar — so new that last minute details were still being completed on this the eve of the vendange. “Everyone is working frantically to get the cellar ready,” she wrote. “Rémi, the electrican, Tony, the ébéniste (cabinet maker) and Vladimir the plumber.” An early night, she said and no coffee. She and her partner,Pierre, and her employee Stéphane would finish installing the égrappoir, the machine used to destem the grapes and the groupe de froid, a cooling machine. Despite all the activity, some things such as the “handy elevated metal path,” that would allow her to walk from vat to vat (there are nine of them, each about 12 foot high) without climbing ladders. “I am wondering whether this shall be installed at all,” she wrote. It was, several weeks later. I set my alarm for 6 a.m. although I didn’t sleep much anyway mostly because I was worried that I’d oversleep. It was still dark when I drove through Laurens to the Caveau des Schistes, a big wine cooperative, on the highway. Compulsive about not being late, I arrived fifteen minutes early and sat in the darkened parking lot with the car idling waiting for Brigitte so that I could follow behind her to the Corneilhan vineyard. In her e-mail, Brigitte had talked in terms of a military operation; waiting in the dark and empty parking lot I felt more as though I’d arrived for an assignation –or was truly desperate for the place to open so I could buy wine. And then a car pulled up. It wasn’t Brigitte. It was a man. He motioned for me to roll down my windows. He spoke to me in French. I heard, or rather understood, the word vendange–actually the only word I understood. A picker, I guessed. Brigitte arrived and talked to the guy then he drove off. He’d wanted work, she said, but she had all the pickers she needed. By the time we reached the vineyard, the sun was rising and the Polish team was off to an early start. Soon it was warm and sweaters and shirts were discarded, draped on the vines like exotic fruit. By noon, the first load of Grenache grapes had been driven off to Domaine de Cébène– the first pressing in the new cellar. One vendange down, several more to go, but with most of the grapes still on the vines, the bad weather began in earnest. Rain came down in historic proportions — in some areas, three months worth in less than 24 hours. Days of heavy grays skies, nights of more rain and percussive thunder. During a lull, I took a walk around the village. What I’d thought was a dry stream bed — something equivalent to the Los Angeles River — flowed with muddy yellow water. I woke in the middle of the night to the sound of my front door slamming. The wind had blown it open, then closed. France Météo placed the region on orange, then red alert. Red, the highest means that all public functions are cancelled. Many areas were without power. I sat at my desk, distracted by the rain outside. As though I needed further verification, I obsessively checked the weather on my Iphone. I sent anxious e-mails to Brigitte who thanked me for my concern, but didn’t seem unduly alarmed. A local newspaper ran a picture of a vintner leaving his cave in a canoe. Then a brief reprieve forecast for the coming weekend and a window of opportunity for growers to bring in the rest of the crop before the next deluge. Brigitte too had decided to harvest, again after a lot of consideration. Another Friday evening, another e-mail. On vendange demain ou on ne vandange pas? We harvest tomorrow, or we don’t harvest? The Syrah was ready but, understandably given the race with the weather, pickers were in short supply. The Poles were working elsewhere and Stepháne wouldn’t be available with his tractor — he was needed by his father-in-law who also had grapes to bring in. Brigitte was short of cagettes, the heavy plastic crates used to hold the picked grapes, fifty of them would have to be picked up the next day from a fellow grower. Saturday morning I again left Laurens just before dark, this time for the short drive to the vineyard in Faugéres. I was not alone. The dim morning sky glowed with orange lights from a procession of harvesters and tractors en route to the vineyards. Although she’d rounded up a small team of pickers, Brigitte was anxious. It wasn’t raining, but the air was warm and heavy with moisture; mushrooms had sprouted between the vines, and a few grapes spotted pale furry overcoats of mould. What was needed, she said, was a cold, drying wind, but Mother Nature wasn’t listening. Weather wasn’t the only problem. The area to be harvested was on a steep hillside and the logistics involved in transporting picked grapes to the cellar were tricky. In Corneilhan a week before, the cartons of picked grapes had been loaded onto a van that moved slowly between the vines but the hilly Faugéres terrain made that impossible. Instead the filled crates had to be carried to the waiting van. I walked up to the top of the hill, in the vineyards all around either mechanical pickers or humans stooped low over the vines. Clouds hovered over the hills, rain seemed imminent. I wondered if the weather would hold until the end of the day. It did. By Sunday evening, the grapes were safely inside the cellar. It could have been much worse, Brigitte said. More rain again and a little adventure. All the water washing down the hillside at Domaine de Cébène had completely uncovered a trench in which electrical lines were laid exposing, as Brigitte pointed out, a nice layer of Faugères schist. I went to take a look, parked my car too close to the edge of a muddy bank, tried to back up, got stuck even further and had to call for a tow truck. Or rather Brigitte called for me, no words in my limited French vocabulary to cover the situation. On the bright side, I now know how to say in French that my car fell into a ditch. Hopefully, I won’t have another opportunity to use it. That last weekend, we all sat around a table in the sun, eating lunch and tasting some of the freshly pressed juice from the Syrah. Vlad the plumber wore a black t-shirt that read I❤️ Doritos Locos Tacos. I wanted to ask if he really did, but I didn’t trust my French. His wife told me, in French, that they have a son in San Diego, so perhaps that’s where the shirt originated. Neither Vlad nor his wife speak English. Nearby, the young Poles, at the end of their working holiday in the French vineyards, were eating Chinese food. I asked if it was good. “Not bad,” one of them said. He spoke English, but not French. Vlad, whose parents were both from Poland, speaks not a word of Polish. A week or so later, Brigitte had a lunch to celebrate the end of the vendange. I sat next to a Swedish couple and we all spoke English. She had used grape leaves from Brigitte’s vines to make the Greek appetiser, dolmathes. Brigitte liked the symmetry of it all –drinking the wine, eating the leaves of the grapes, later, perhaps, burning some of the wood trimmed from the vines. I like the way that it does sometimes seem like a very small world.